Like the Rolex Explorer, the Rolex Submariner gained a significant increase in popularity once it was a part of a major accomplishment. In September of 1953, Auguste Piccard and his son became took a bathyscape to 10335 feet under the sea, which was the deepest dive in history. This amazing feat was accomplished with a Rolex watch on the wrist of Piccard. Rolex took the features of this watch and improved upon them to create the world’s first watch built specifically for deep dives. At the Swiss Watch Fair in 1954, Rolex introduced the first Rolex Submariner. As the first watch built for divers, the Rolex Submariner features several innovative functions. The rotating bezel allows divers to measure the time elapsed during their underwater dive. It only rotates one way to prevent a diver from spending too much time underwater. The modern day Rolex Submariner watches can withstand up to 1,000 feet of underwater pressure. The early models featured long slender hour and minute hands, while the current Submariner models has thicker, “Mercedes” style hands. The perpetual, self-winding movement is wound by the smallest movement of the wrist. The Rolex Submariner has experienced a successful history and its popularity continues to grow. Because of this the price of Rolex Submariners has varied over time. In the late 1950s, the Rolex Submariner with no date could be purchased for $150 and when factoring in inflation, that is equivalent to roughly $1,248 USD. In the early 1970s, the 18kt Rolex Submariner was introduced and could be purchased for $230, or $1,422 when adjusted for inflation. The stainless steel Submariner with a date had a price of $385, or $2,080 with inflation. The year 1984 saw the introduction of the two-tone Rolex Submariner 16613 at a price of $2,975 ($6,745 when adjusted for inflation). At that time, the stainless steel Rolex Submariner with a date could be purchased for $1,375 ($3,120 with inflation) and the 18kt Rolex Submariner was available for $10,850 ($24,600 USD). The Rolex Submariner with no date saw a significant change in price between 1992 and 1996, going from $2,000 to $2,800 ($3,330 to $4,190 with inflation) and then to $3,800 by 2006 ($4,433 USD). In 2008, the retail price of the Rolex Submariner Date ref. 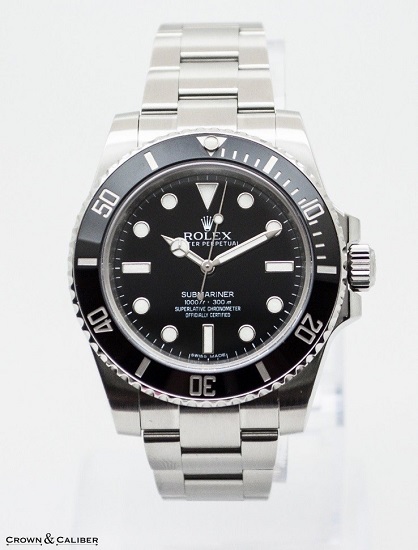 16610 was $6,000 ($6,560 with inflation), the Rolex Submariner no date ref. 14060M was $5,450 ($5,960 with inflation). The stainless steel and gold Submarine ref. 16613 was worth $9,300 ($10,166) and the 18kt gold Rolex Submariner was set at a price of $27,500 ($30,060). That was also the same year that the Rolex Submariner 116610N and 116610V were introduced at a price of $7,250 and $7,725 respectively, with today’s inflation placing them at $7,925 and $8,250 USD. By 2012, the Rolex Submariner 14060M was priced at $6,300 ($6,410 with inflation), the Submariner 114060 was priced at $7,500 ($7,630 with inflation), the Submariner 116610N had a price of $8,550 ($8,700 with inflation), the Submariner 116610V was worth $9,050 ($9,208 with inflation), Submariner 116619 was $36,850 ($37,492 with inflation), and the Submariner 116618 had a price of $34,250 ($34,850 with inflation). A chart posted at http://www.minus4plus6.com/PriceEvolution.htm helped us to arrive at these numbers. Because Rolex Submariner watches are still extremely popular watches today, they continue to hold their value and some of the models have increased in value over time.